Version 1.3 available as a free upgrade via the App Store. Please upgrade. We are no longer supporting Version 1.2. You can check the version you have in the support page of the application. ✴Problem 2: No Offers are downloaded. Quite simply the lists of favourites and offers are large and slow to download (more background details on our FAQ page). So please initially start the program running on a WiFi connection for a few minutes and it should show ‘downloading offers’ and ‘downloading favourites’ in the grey bar at the top of the ‘Basket’. If still no offers then please go to ‘More ...’ then ‘Synchronise’. 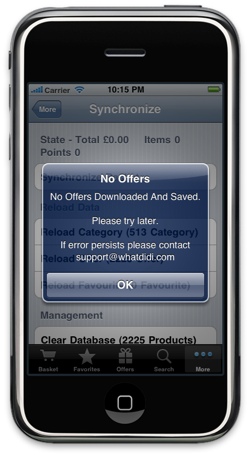 ✴Check the Offer count is zero - as per the left hand screen below - see the text ‘Reload Offer (0 Offer)’. ✴The offers should start loading. Note it takes Tesco about 30 seconds to collect your Offers and begin the download on a WiFi connection. ✴You should see the ‘downloading’ message at the top of the ‘Synchronise screen’ or the top of the ‘Basket’ screen. ✴Most stores have 2000 or more offers. Please be patient. If you continue to have a problem seeing any offers, please DO contact us at support@whatdidi.com as we have a couple of users for which the above did not fix the problem, and we are investigating a store specific problem - we will then ask you to go to the settings menu and turn on more error messages. When you contact us please tell us your postcode and whether you have seen the right hand message below. As outlined above you are welcome to ask for an immediate refund. However we would very much like to hear from you as we are looking for a few people who have this problem to isolate what we think is a a very limited store specific problem - please do contact us. We receive a few mails saying the application does not work. To help you we need a little more information. The common problems we find (and the solutions) are in order below. So please scroll down through the following page for help. Don’t worry if the page looks long - there are screenshots. 1.Ask immediately for a refund, (we do need a Paypal account or postal address for a cheque). 2.Ask for help, we will ask you to turn on some of the debugging features of the program - this will allow us to see error messages generated by the application and by Tesco.com. 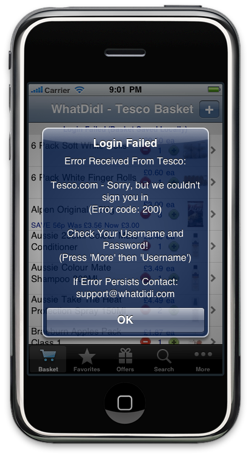 ✴Problem 1: The application can not login to Tesco. ✴You should see a popup message saying ‘Login Failed’, and/or the grey bar at the top of the ‘Basket’ page says ’Login failed’. ✴You may see a screen as follows saying Login failed (left hand screen below). ✴Please first login to http://www.tesco.com/groceries and check you have remembered your username and password correctly. ✴You login to this application using your Tesco.com username and password. ✴Note we do not support Tesco.IE or Tesco USA - please ask for a refund if you are not a Tesco.com user. 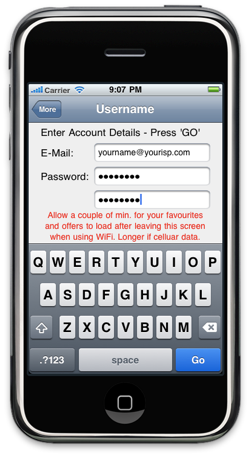 ✴Then in the application select ‘More ...’ and ‘Username’ and re-enter your username and password. ✴The application should try and login again. ✴You may need to then stop and restart the application. ✴If you see the specific message ‘Error code 200’ please see our Error 200 page. ✴If this does not help contact us at support@whatdidi.com telling us if if you see any other error messages . ✴Please go to ‘More ...’ then ‘Synchronise’. ✴Check the favourite count is zero - as per the left hand screen below - see the text ‘Reload Favourite (0 Favourite)’. ✴The favourites should start loading. Note it takes Tesco about 60 seconds to collect your Favourites and begin the download - Favourites will appear to download much more slowly than Offers. ✴If you see the right hand warning screen then Tesco.com is not providing any favourites for your account to the application. 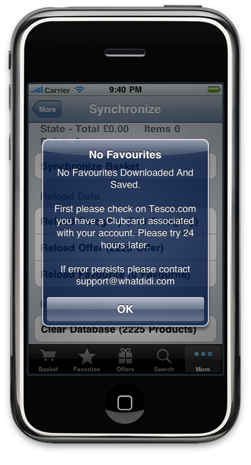 Please login to Tesco.com and check on Tesco.com that you have a Clubcard associated with your account - Tesco’s Favourites are stored with your Clubcard. Note that when you associate a Clubcard with your Tesco.com account it may take a couple of days for your Favourites to appear. ✴If this did not help you please contact us at ‘support@whatdidi.com‘ and we will ask you to turn on some additional debugging - we will want to determine if there is an error at your store preventing downloads, or if for some reason the application is downloading, but not storing Favourites. ✴If you are technical you can look at our download debug information page here. ✴Problem 4: Empty basket? 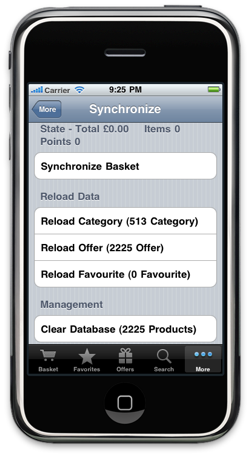 Please press the ‘+’ button at the top right of the basket and try an add an item to the basket using ‘search’ or categories. If you are still having problems please now contact us support@whatdidi.com as outlined at the top of the page. ✴Frequently Asked Questions - we answer some common questions. E.g. How about a barcode reader?